Due to the update of the forums, new options have appeared in the members' profiles. This tutorial will try to explain these new options, and to explain the numerous options available while registering, once registered, and those reserved to the forum admins at the same time. - Username : Here, type the username you will use to log on. Important : This adress can be seen by administrators and the member who has the corresponding username only. - Password : Here, type the password you will use to log on. Website, location, humor, job/hobbies,etc. 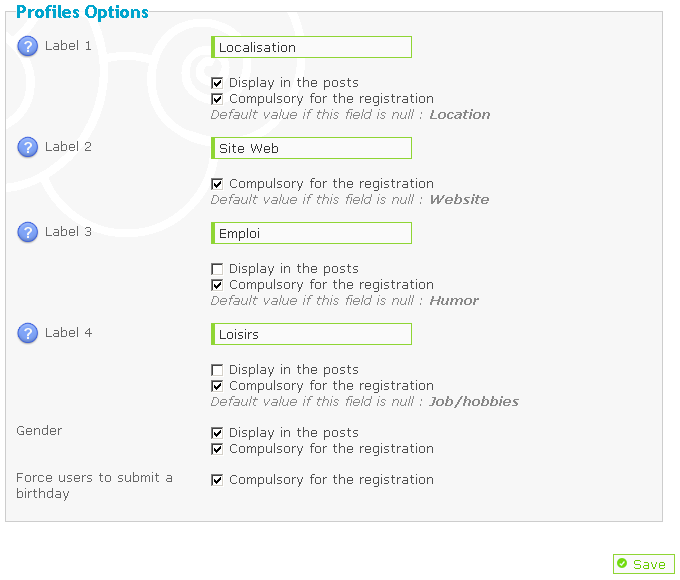 : These labels can be configurated via the admin panel. The administrator can choose to make them compulsory for registration or not and choose to have them shown in posts. If they are not compulsory, they won't show up in the registration form. - Allow members to contact me by email : Select by a website form to keep the usual way, or by client email software if you want the other members to contact you using their software (Outlook Express, Mozilla Thunderbird, etc...). If you select no, this icon : won't be displayed when a member looks at your profile. - Hide your online status : If you select yes, you will appear as a Hidden member in the Who Is On Line. Please note that the administrators are able to see the hidden members, and so can the moderators (if this option is activated). Note: However, you will appear in the "Members connected during last X hours"
- Always notify me of replies : Select yes to receive an E-Mail when a reply is posted in a topic you are participing to (this mail is often considered as spam by some mail adresses (like Hotmail for exemple). - Pop up window on new Private Message : If you select yes, a new window will open as a pop up when you receive a PM (the pop-up window will open if you are on the forum only). - Always attach my signature : Check this box if you want to add automaticaly your signature at the bottom of each of your posts, or only at the bottom of some of the posts (by checking the box Attach my signature when replying to a post). - Always allow BBCode, HTML, Smilies : As for the signature, you can choose to activate these options for all of your posts, or only for some of them. 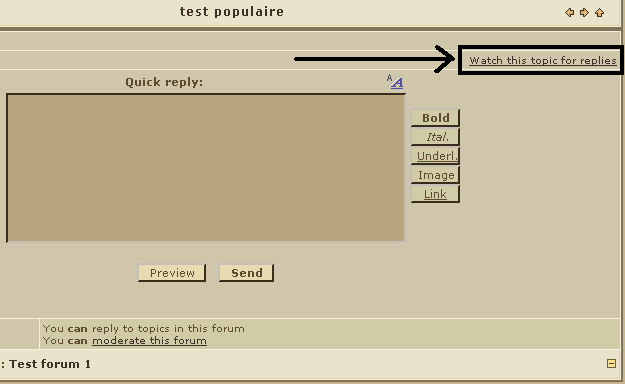 - Date format : Here, you can choose from the menu the diplay format of the date on the forum. You can edit your Avatar by visiting your profile settings by clicking on the "Profile" link in the top navigation bar. Click further on the tab "Avatar". 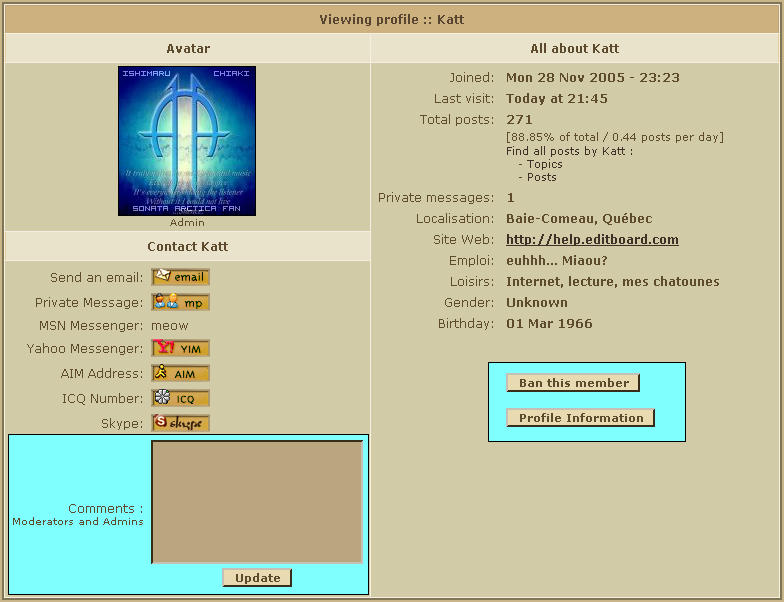 Notice from Katt : The Browse button's language depends on your browser's language, so if your browser is in French like mine, you will have "Parcourir" instead of "Browse"
- Upload Avatar from your machine: If the picture you want as an avatar is on your PC, simply click on browse, and then select the image on your PC. Note that it's width must not exceed 150 pixels, it's height not 200 pixels. The filesize must be kept below 64kb. If you upload an image larger in filesize, you'll get an error-message. However, if you are uploading an image that exceeds the maximum dimensions, your picture will get resized automatically. This will in most cases destroy the pictures transparency and quality, so be sure to not exceed the limits. - Upload Avatar from a URL: If you find the perfect image on a website, all you have to do is to copy the image's address, and then paste it into the form and save. It's width can be no greater than 150 pixels, the height no greater than 200 pixels. Beware of images wich are under copyright. - Link to off-site Avatar: The same as before. The only difference is that the image's height and width can be greater than 150*200 pixels. Beware of images wich are under copyright. It's also highly recommended to re-host all images on your own image-hosting service (ServImg or Photobucket for example), as you'd otherwise use the bandwith of the server that contains the original picture - this would be illegal!! - Select Avatar from gallery: You can also choose an image from the forum gallery, if you don't want to browse the web to find one. 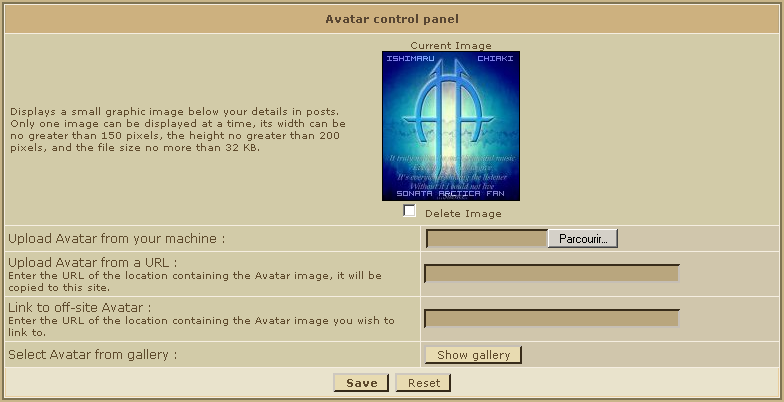 This option has to be enabled in your admin panel if this has not been done already (Display >> Avatars >> Avatar Gallery). Here ("Personal Avatars" - tab) you can also add or remove images to this gallery. The space is limited though. Signature settings are to be changed in your profile settings as well (in the top navigation bar) - just switch to the "Signature" tab there. The signature space is limited to 500 characters, this cannot be increased. You can use bbCode and HTML as well in your sig, if it has been allowed by the administrators in the admin panel (General >> Forum >> Messages & Email >> Allow HTML / BBCode). My Signature is not displayed, what should I do? - Private messages : Here you will be able to see the number of private messages sent by a member (useful if the member doesn't post in the forum). - Ban this member : Click on this if you want to ban this member. 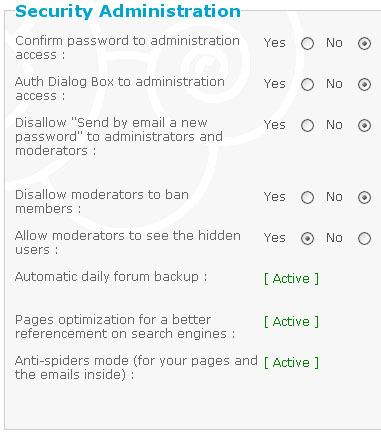 Moderators won't see this option if "Disallow moderator to ban members" is activated in the Administration Pannel. - Admin's comment :: Here the administrators can put comments about members (moderators can do it while looking at a member's profile), these comments will be viewable by administrators and moderators only. IMPORTANT : If the member has never been activated, you will have to go to "Admin Panel Users & Groups Users Inactive users" to activate accounts manually. - Can send Private Messages :: Here you can (dis)allow your members to send Private Messages. - Can display avatar ::Here you can (dis)allow your members to display an avatar. - Delete this user? 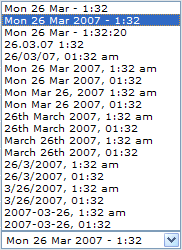 :: Check this box to delete a user (this can't b undone unless you restore your forum to a previous date). Use this option to leave the possibility to this member to re-register later. If you don't want him to be able to register using the same mail adress, it is instead recommended to ban him. Still within your admin panel, go to "Users & Groups / Users / Profile"